Few experiences compare to that of relaxing in one of the lodge's three hot tubs, glass of wine in hand, and gazing at the dazzling Northern Lights as they play across the night sky. Late check out & upgrade subject to availability on arrival. Here in the midst of a vast, unspoiled landscape of rivers and rolling fields, volcanoes and snow-capped peaks, is a rustically elegant lodge that seems to float at the very edge of civilization--but then, isn't that why you came to Iceland in the first place? Because, to truly experience this surreal country that straddles the Arctic Circle, you must leave the familiar behind and embrace the eerie beauty of places like its South Coast, where Hotel Rangá stands guard over the pristine East Rangá River, and where wanderlust is rewarded with treks to nearby glaciers, jeep tours along black-sand beaches, and visits to authentic fishing villages. Here also, you'll enjoy more than an iota of little luxuries, and in a most unexpected setting. How are they able to serve such amazing gourmet cuisine in seemingly the middle of nowhere (in reality, only two hours from the international airport)? Look no further than the river outside the dining room's panoramic windows, one of Iceland's finest salmon runs, or the local pasturelands of sheep and even reindeer. Fresh seasonal ingredients are another mainstay of the restaurant, which prides itself on its "Farmer's Market" concept--along with an equally impressive wine list and a reputation for excellent service. Then there are the cozy and comfortable guest rooms, beckoning you to relax and rest up for the next day's adventures. But it's the seven suites at Hotel Rangá that are, quite literally, a world apart, each cleverly themed for a world continent, from Asia and Africa to Australia and Antarctica. 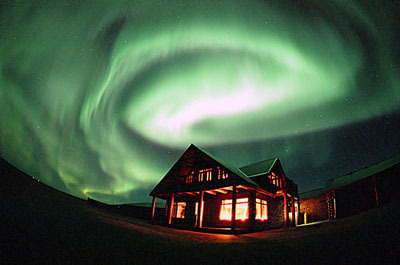 Don't worry, if you think you might succumb to sleep before the evening "show" starts--and by show, we mean the Northern Lights--ask for a wake-up call from the ever-vigilant staff!